In alternative energy industry, going off the grid means to cease your house, apartment or office building’s power connection from the utility grid and fulfilling your energy needs with the help of alternative energy sources. Apart from producing electricity through traditional ways, there are some unconventional ways as well to produce electricity. § You probably have become so fed up with your energy bills that you want to opt the way where you can get continuous supply of energy by making a onetime investment. § You are under so much weight of your conscience that you don’t want to add your share in destroying the ecosystem of the earth with the use of traditional and harmful energy sources. To get electricity from wind, a wind turbine is used which converts wind’s kinetic energy into electrical power. To get the optimum results of wind turbines, it is essential to have good speed of wind in the area where they are going to be installed. Solar power is the conversion of energy of sunlight into electricity with the help of photovoltaic cells that are arranged in long arrays on solar panels. Getting off the grid is more feasible when you use solar energy as your alternative energy source due to its efficiency and it’s easy to find plentiful sunlight than the speedy winds. 1. 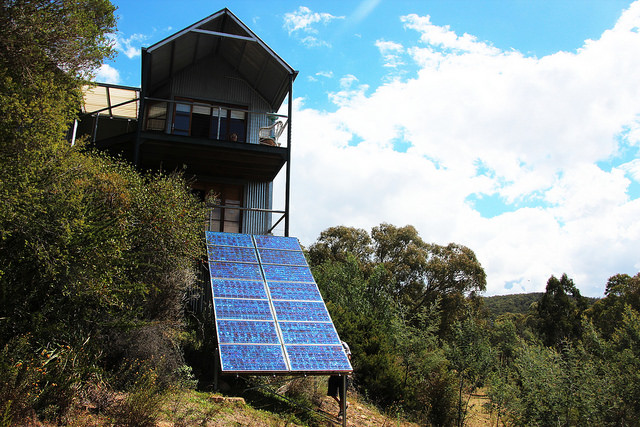 If you want to go off grid then make sure that you properly research for the all the required equipment that are needed to establish the fool proof electricity system. You can consult some professional alternative and renewable energy providers for this purpose, they will tell you about how to make a balance-of-system which is essential to store, condition and transmit the electricity produced by solar panels. Creating a balance-of-system is very crucial if you are getting off the grid because it will help the system to store the energy which is used when solar panels are not producing the energy. 2. Once you are done with choosing the right equipment to set up your off the grid system, you must estimate your electricity load and consumption because your energy needs will decide the number of solar panels and the power ratings of storage batteries that you need. 3. Finally check the state laws and jurisdictions that govern the use of alternative energy. Make sure that the alternative energy system that you are going to install is not violating any building codes. Completing all this checks will save you from the future inconvenience. Getting off the grid is not an easy decision but if you pull it off successfully then it can turn around your life. Not only will you be saving a lot of money every month but you will also be contributing in saving the environment from fossil fuel.